We want comforting food. It’s cold and wintery and the economic climate isn’t that hot either. It’s time to get back to those old-fashioned values. Gennaro Contaldo introduces us to his Italian family favourites in Let’s Cook Italian. They do travel rather well, and they are delicious. Gennaro often graces our TV screens, sometimes in the company of Antonio Carluccio, another Greedy Italian, or that young Jamie Oliver. Gennaro is a lovable character with a cheeky grin and a down-to-earth approach to food. Yes, he is a celebrated food professional but he has never lost his grasp of domestic kitchen reality. To be a confident cook we need a battery of recipes that work. We need to feed family, friends and in-laws so a list of well practised flavourful dishes that please everybody will save time and worry. Impressive food doesn’t have to be expensive or even time-consuming. Let’s Cook Italian offers practical recipes for traditional dishes and a sprinkling of contemporary ones. There are, as one would expect, plenty of suggestions for pasta – dough, sauce and fillings – and some of those traditional to Gennaro’s family will likely be new to the British cook. Culurzones – Sardinian ravioli filled with cheese, potato and fresh mint – is one such recipe that uses a rich mix of cheeses pillowed by the humble and, as yet, cheap, spud. The sauce is buttery and perfumed with sage but I would love this ravioli with a herby tomato sauce. A vibrant dish for the summer is Peperoni All’adrodolce – Tangy Peppers. Make these when peppers are at their best quality and price. You can use them at every meal and either hot or cold. The recipe calls for anchovies: don’t be tempted to leave them out. Your finished peppers won’t taste fishy, but those fillets give a distinct salty edge which is key to the success of the dish. A spectacular and traditional dish is Porchetta – Stuffed and Rolled Pork Belly. It’s a striking centrepiece to feed a crowd. The most difficult step is finding a large enough roasting pan, but I can guarantee that you will feel it’s worth the investment in a new one. Gennaro has suggestions for side dishes with recipes provided. Perhaps my pick of the book will be a surprise. It’s a pie, Sformato di Pane alle Verdure, and Italians are not famed for that form of savoury patisserie. Gennaro presents a variation of a family favourite that was eaten around Christmas time. It would be a vegetarian alternative for the festive season but even meat eaters would enjoy this robust bread-dough pie with its filling of artichokes, courgettes, onions and potatoes. 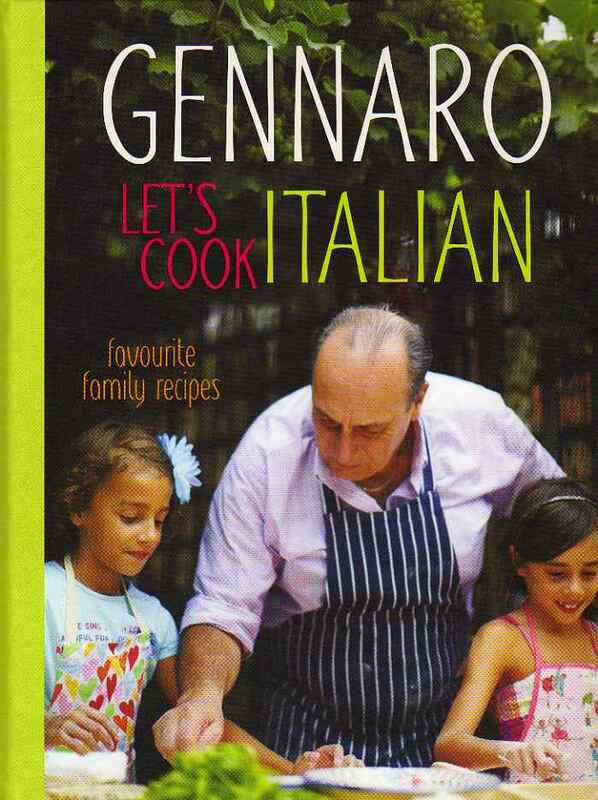 Let’s Cook Italian is just what I would expect from Gennaro Contaldo. It’s charming and family oriented. The recipes have been thoughtfully chosen and should give no British cook cause for anxiety over technique or ingredient. A beautiful book and good value for money.